After two members of the Railroad Commission's board sparred over the fate of the agency's executive director, questions arose about decision-making and transparency within the state agency. Today’s Texplainer is inspired by a question from Texas Tribune reader Linda Logan. Hey, Texplainer: Did the chairwoman of the Texas Railroad Commission terminate the agency's executive director? 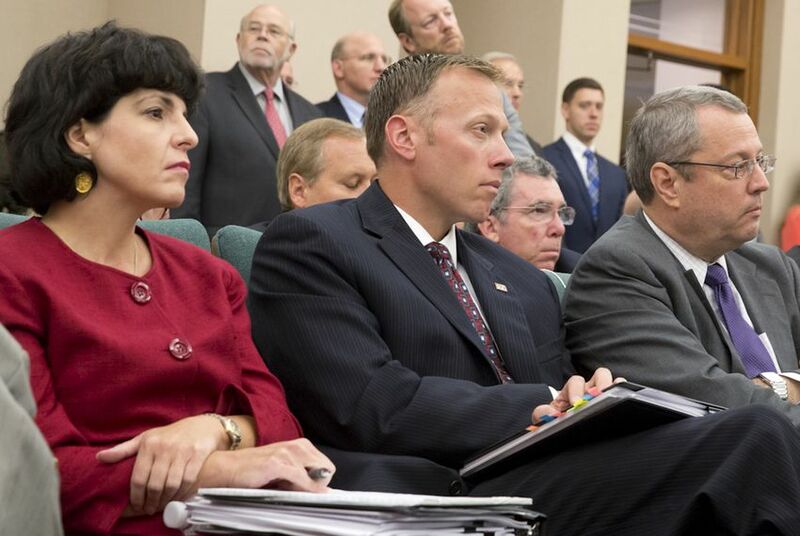 In a meeting last month, Railroad Commissioner Ryan Sitton and the board's chairwoman, Christi Craddick, sparred over the fate of the agency's executive director, Kimberly Corley, a spat that spurred questions about decision-making and transparency within the state agency. Tensions came to a head after Craddick revealed she had met with Corley, the agency's general counsel and a human resources manager to discuss Corley’s job performance and then said Corley could either resign privately or be fired publicly. Corley opted to resign. Sitton brought up the meeting between Craddick and Corley at a commission meeting, where he likened it to how one would run a “dictatorship” and accused Craddick of trying to oust Corley, who has been in her post since late 2015, without consulting the commission's two other members. Following Corley’s resignation, the three-chair board unanimously voted Wei Wang, the agency’s chief financial officer, to serve as the agency’s interim executive director — a move that was finalized on Oct. 16. Wang will “keep the trains running while we’re looking for a new executive director,” Sitton said. Some legal experts say Craddick should’ve handled the situation differently. Bill Aleshire, an Austin attorney who focuses on governmental transparency and accountability, told the Tribune that no railroad commission chair has the authority to unilaterally fire someone from the agency. It takes the vote of at least two commissioners to make such decisions. Aleshire added that if Craddick had spoken with any other commissioners about firing Corley, it may have been violating the Open Meetings Act, which prohibits a quorum of local and state government boards— in this case, any two of the board's three commissioners — from discussing government business unless it is in an open meeting that has been announced to the public. Despite this, Craddick supporters have argued that when given the option to resign, Corley could’ve chosen a public meeting where the other two commissioners would’ve been able to weigh in on her fate at the agency. Sitton, however, said a public meeting would’ve been impossible because he believed Corley's access to an agency cellphone, computer and other property were cut off after the Monday meeting. "These facts make it hard to imagine she could have availed herself of the opportunity to request the type of open meeting discussion" he said is guaranteed under state statute. “What I wonder is whether the executive director thought [Craddick] already had the votes lined up to fire her,” Aleshire said. Two days after Sitton and Craddick clashed publicly, Sitton wrote a letter asking Attorney General Ken Paxton to weigh in on his colleague's actions and whether giving an employee the “choice” of resigning or being fired constituted termination. A spokesperson for Paxton’s office confirmed to the Tribune that the attorney general’s office had received Sitton’s letter and are currently processing it. According to Aleshire, however, Craddick’s actions don’t constitute termination — she just should’ve handled the situation differently, he said. “Technically, I don’t think giving her the choice to resign or take it to the Commission for a vote counts as a termination because the Chair did not fire her nor did she have the authority to do so on her own,” Aleshire said. Going forward, Sitton said Thursday he plans to lead a discussion on establishing “best practices” for hiring and evaluating an executive director and other staff so similar situations don’t happen in the future. The bottom line: While Craddick may not have formally fired Corley, her conversation with the former executive director effectively constituted an ultimatum. Experts say she should’ve held a formal meeting with all three commissioners rather than meeting one-on-one. Shannon Najmabadi and Jim Malewitz contributed to this report.